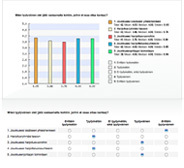 Results can be read in real-time online and saved on your computer. What is included in Qualette? Innovative way of gathering ideas and views into a chosen theme.